Yesterday at RCIA we went around the room saying, in one word, who Jesus is to us. I think I said truth and someone said love, then light and other standard answers followed. The whole time I was thinking Jesus is way more than this people, but I was at a loss for how to raise him up to his heights in one word. This morning (after my second cup of coffee- nothing really happens until after that) the word came to me like a bullet train to Tokyo- SUPERSTAR! The word for “The Word” is Superstar! Jesus Christ — SUPERSTAR! With this revelation in mind I proceeded to go to my Bikram Yoga class. As I worked towards inevitable heat stroke I contemplated Jesus Christ Superstar (the man not the movie). What makes him a superstar? Well, for starters he’d probably suffer through 105 degree Bikram heat without running from the room midway through class gasping for air (like I do). Maybe he’d be the instructor or better yet the master student with his leg over his head. Possibly Jesus would be the humble beginner falling and stumbling but not giving up. Or most likely the man who comes in afterward to mop up all the sweat and provide a clean slate for the next class. All stellar examples I thought as I smooshed my nose into my mat and tried to breath—Jesus is a little bit of all of that, but what brings him to Superstar status? 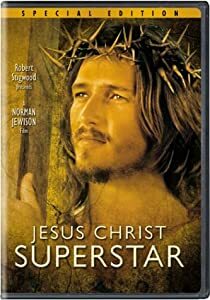 The song kept running through my head…“Jesus Christ Superstar … Jesus Christ Superstar“. Well, let’s see, To be a superstar you have to have fans — a lot of fans. To be a superstar you have to do something new and spectacular. To be a superstar you have to transcend boundries. To be a superstar you have to die young. Check-check-check-check but this could be any superstar. Right about this time the yoga heat started breaking into my superstar meditation. “How the heck hot is she going to make it today?”, I whimpered, “I’m withering, burning…this is what hell must be like! Must keep going… must focus”. I thought of the cool room outside and the water fountain and had a little vision of diving into a pool while a hot waiter stood ready with a Pina Colada. Alas, instead I was trying to make myself into a bow. THAT’S what makes him The Superstar! Not only did Jesus deny temptation but he did it with the knowledge that he would have to suffer horribly and die. 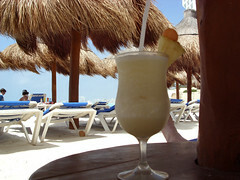 He could have had as many Pina Coladas as he wanted but he chose to stay in the Bikram room- for us! That, my friend, is why the word is Superstar! p.s. good luck trying to get the song out of your head! I will be thinking about one name to call Jesus, although only one will curtail any depth.